£80 - We will fit this item for you. Specially engineered to suit the Short Wheel Base Fiat Doblo Van or MPV 2010 on. Also fits the Face lift model. Our Sahara B2 Side Bars Steps are the latest in Style for your Fiat. The quality of fitting is just Excellent!! The finish is gorgeous hand polished mirror look stainless steel. Easy to fit and strong enough to Stand on. Just look at the photos to see the quality and workmanship in this product! We use only the Best European Quality Stainless Steel Tube from Italian Steel Mills. Our Tube has a massive 1.5mm wall thickness for great quality Side Bars and Steps. The price includes a pair of Sahara Side Bars with 4 Black Steps Inserts for Doblo Short Wheel Base that fix to original mounting points. These are a NON DRILL product and are supplied complete with all the mounting brackets ready for installation. Our Side Bars & Steps are Hand Polished to a mirror finish. This product fits all 2010 on Short Wheel Base models including: Active, Mylife and Eleganza MPV. Hand Polished 70mm Chunky European Quality Stainless Steel. Massive 1.5mm thickness tube walls produced in Italy - Beware of inferior Chinese Copies! 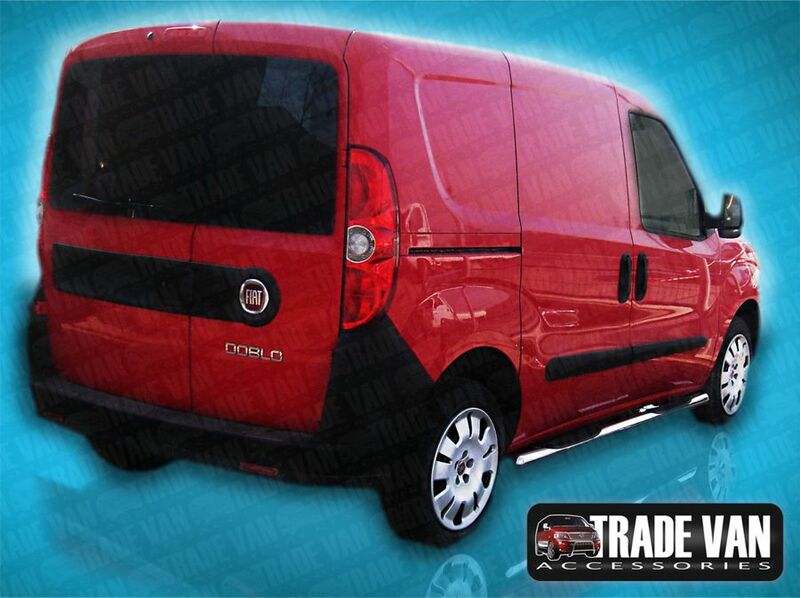 Stunning value for your 2010 on Fiat Doblo Van or MPV giving an excellent finishing touch. *Note: Will NOT fit LWB Maxi Models, or earlier Doblo Vehicles If in doubt feel free to call our Sales Team who will be more than happy to assist! Click the button below to add the Fiat Doblo Side Steps B2 Side Bars Stainless Steel SWB 2010 on to your wish list. Trade Van Accessories is protected by Copyright © 2015. Do not reproduce this website or it's images in whole or in part without permission.